Aaron Gabriel (CCE Capital Region) and Ken Wise (NYS IPM) report finding potato leafhopper (Empoasca fabae) in Eastern, NY. In a new seeding near Kinderhook, NY we found 20 potato leafhoppers in 10 samples of the sweep net (1 sample=10 sweeps) in 10 inch alfalfa. This is below threshold but a fair amount this early in the season. Here is how to identify potato leafhopper. 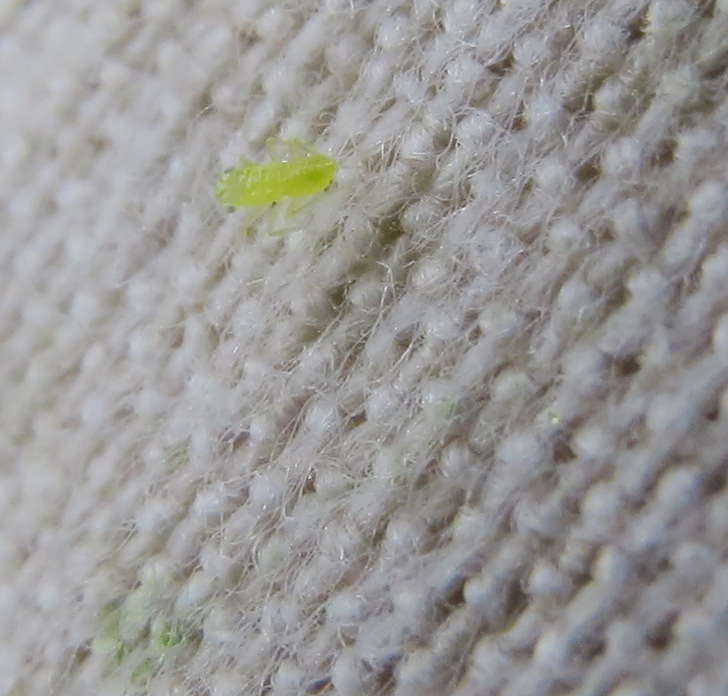 Adult potato leafhoppers are lime green and slender about 1/8 inch long. Nymphs are even smaller lime green without wings. Jeff Miller (CCE Oneida-Madison County) and Ken Wise (NYS IPM-Eastern NY) report catching true armyworm moths in their pheromone traps. There are no reports of armyworm larvae feeding on corn or small grains. Last week Aaron Gabriel (CCE Capital District) found small larvae in a hay field in Washington County. Keep an eye out for this insect pest. Here is a link to an IPM article on true armyworm: http://blogs.cornell.edu/ipmwpr/true-armyworm-aka-common-armyworm-pseudaletia-unipuncta-in-field-corn/ . Last week temperatures ranged from 4 to 12 degrees above-normal. Precipitation has ranged from a trace to 2 inches. Base 50 growing degree-days ranged from 40-160. Showers and thunderstorms Thursday and Friday, some could produce gusty winds and locally heavy rain with perhaps isolated flash flooding. Today temperatures will be in the 70s to 80s and humid with showers and thunderstorms possible (scattered to numerous, more likely for western to central NY). Overnight lows will be in the 60s. Friday will be humid with highs in the 80s and showers and thunderstorms likely. Overnight temperatures will be in the upper 50s to mid 60s. Saturday will be cooler and less humid with seasonable temperatures in the 70s. Scattered showers are possible for southeast NY, but the rest of the state will be dry. Overnight temperatures will be in the 50s. Sunday highs will be in the upper 60s to mid 70s with dry conditions. Overnight temperatures will be in the 50s. Monday highs will be in the upper 60s to mid 70s with scattered showers possible. Overnight temperatures will be in the 50s. Tuesday highs will be in the upper 60s to mid 70s with scattered showers possible. Overnight temperatures will be in the 50s. Wednesday highs will be in the upper 60s to mid 70s with scattered showers possible. Overnight temperatures will be in the upper 40s to mid 50s. The seven-day precipitation amounts will range from 1 ¼ inch to 2 ½ inches. The 8-14 day outlook (June 7-13) favors below-normal temperatures. The precipitation outlook favors near-normal amounts for southeast New York, and favors above-normal amounts for the rest of the state. *Evaluate established legume stands for harvest. *Monitor new seedings for Pythium blight and Phytopthora Root Rot. *Emergence: assess stand, population count, bird and early season insect issues e.g. black cutworm, wireworm, white grubs. *Check and mend fences as needed. *Arrange for custom weed control or check your own application or cultivator equipment for repairs. -pesticide application equipment – Check nozzles, pumps, etc., recalibrate pesticide application equipment before use.